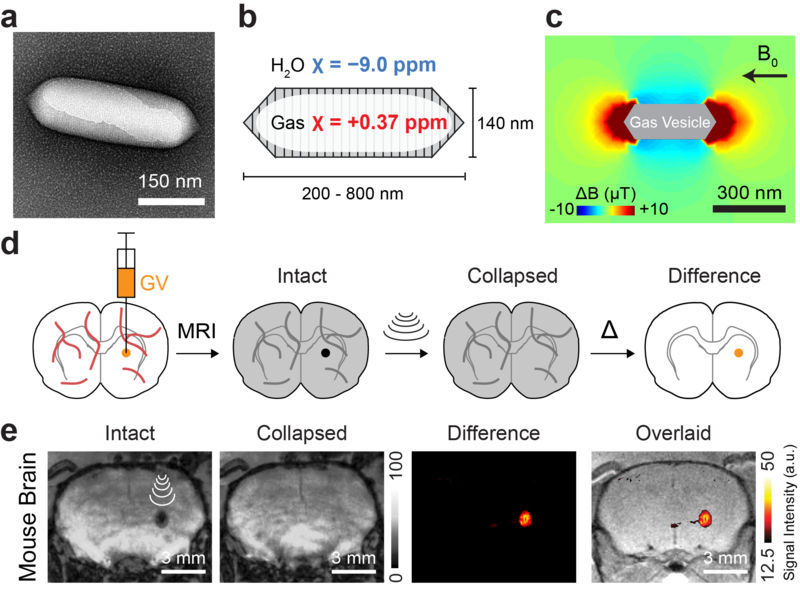 How gas vesicles can serve as an MRI probe that is erasable by ultrasound. The ability to directly visualize biological processes inside opaque living organisms is a technological holy grail for both basic biology and diagnostic medicine. In this context, fluorescent proteins, which have revolutionized the study of optically accessible biological specimens, have limited utility due to the poor penetration of light into tissue. To address this limitation and provide an imaging method that can potentially be scaled for use in humans, researchers have turned to other modalities, such as magnetic resonance imaging (MRI), which enables high-resolution non-invasive imaging of deep tissues. However, a major outstanding challenge is to develop imaging agents for MRI that are equivalent to fluorescent proteins in their ability to reveal molecular and cellular information. Several pioneering groups have approached this problem by engineering contrast agents based on paramagnetic metalloproteins and polypeptides with a large number of chemically exchangeable nuclei. However, each of these agent classes has significant limitations to go along with their advantages . When I joined the laboratory of Mikhail Shapiro, I wanted to approach this problem from a different angle. The group was already working with a unique class of protein nanostructures called gas vesicles (GVs). GVs are on the order of 200 nm in size and composed of a ~ 2-nm protein shell that allows the exchange of air but prevents liquid water from forming inside (GVs evolved in photosynthetic microbes to serve as floatation devices to regulate buoyancy). While others in the group were engineering GVs as ultrasound imaging reporters  based on the ability of air to scatter sound waves, Mikhail and I were inspired by the knowledge that air is also a well-known source of contrast in MRI. This is due to its positive magnetic susceptibility compared with diamagnetic water, as seen in image artefacts near gas-filled organs such as the lungs. Albeit smaller by many orders of magnitude, perhaps the air chambers of GVs could produce the same susceptibility contrast as the lung? Additionally, from work in the group on ultrasound imaging, we knew that the air inside GVs can be remotely eliminated by the application of ultrasound, which suggested that we might be able to turn off the MRI contrast by ultrasound. In the next few months, we successfully conducted experiments that confirmed these hypotheses. Perhaps the most memorable moment was our first in vivo experiment. Mikhail, Arash Farhadi (a graduate student in the group), Jerzy Szablowski (a postdoctoral fellow) and I spent several hours to inject GVs into the brain of a euthanised mouse, then performed animal MRI and MRI-guided ultrasound. Around midnight, after sorting out multiple technical problems, as is typical of the first attempts at new experiments, we successfully observed a big change in MRI image intensity after clicking the button to deliver ultrasound pulses. Excited by these results, we celebrated this achievement by going to old-town Pasadena for midnight hot dogs and beers. This was a special moment, because we knew we had just opened a new direction in the field. Building on this result, our subsequent experiments extended the utility of GVs to include background-free imaging, acoustic multiplexing, multiparametric MRI fingerprinting and clustering-induced dynamic contrast with help from various members of our laboratory. This work established the unique features of GVs as a new type of protein-based MRI contrast agents (Figure 1). Figure 1. Gas vesicles (GVs) serve as a probe for MRI that is erasable by ultrasound. (a) Transmission electron microscopy (TEM) image of a GV. (b) Schematic drawing of a GV, whose air-filled interior has magnetic susceptibility (red) different from that of surrounding H2O (blue). (c) An air-filled GV in water exposed to a 7T horizontal magnetic field (B0) can produce a surrounding magnetic field gradient, in which freely diffusing water molecules will experience enhanced T2/T2* relaxation. (d) Diagram and (e) imaging results of the in vivo experiment in the living mouse brain. MR image taken before the application of ultrasound was subtracted from that taken after. The resulting difference image revealed signal intensity specific to that of GVs and was overlaid on an anatomical image. Images adapted from our paper. 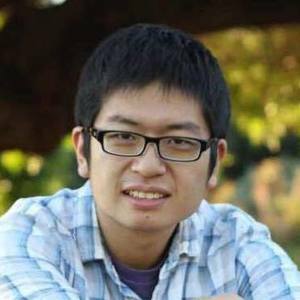 We envision that these protein nanostructures can be used both as reporter genes in engineered cells and as injectable probes for imaging regions where background tissue contrast presents a considerable challenge for existing contrast agents. Also, the demonstrated benefit of combining MRI and ultrasound to yield modulatable contrast has stimulated our thinking about how we could do this in more scenarios – and formed a bridge between the MRI and ultrasound parts of our lab . We look forward to more midnight beers and hotdogs in our future. Our paper: Lu, G. J. et al. Acoustically modulated magnetic resonance imaging of gas-filled protein nanostructures. Nat. Mater. 17, 456–463 (2018). Mukherjee, A. et al. Biomolecular MRI reporters: Evolution of new mechanisms. Prog. Nucl. Magn. Reson. Spectrosc. 102-103:32-42 (2017). Maresca, D. et al. Biomolecular Ultrasound and Sonogenetics. Annu. Rev. Chem. Biomol. Eng. (2018). Lu, G.J. et al. Proteins, air and water: reporter genes for ultrasound and magnetic resonance imaging. Curr. Opin. Chem. Biol. 45:57-63 (2018). Cover image credits: Barth van Rossum.